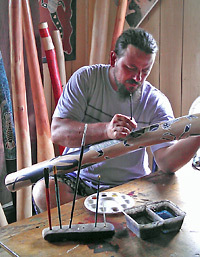 Earl Clements has been making and painting didgeridoos for over 15 years. 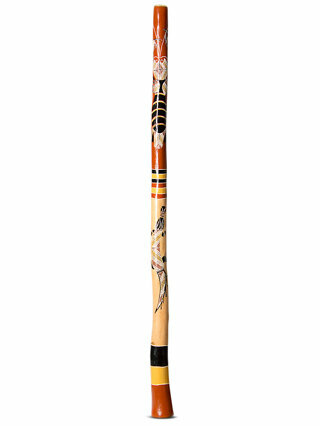 Originally from New South Wales, he has spent the last 20 years in the Northern Territory (between Darwin and Arnhem Land) where he has been focusing on his artwork and didgeridoos. 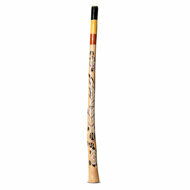 Earl is a versatile maker who produces both natural finish didgeridoos and a variety of decorated style didgeridoos including painted, carved and burnt pokerwork. 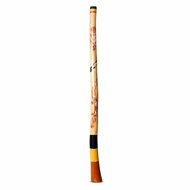 He is one of those talented and unique didgeridoo craftsmen who are able to express their artwork on a didgeridoo while at the same time still producing a quality instrument. Earl's Aboriginal heritage comes from his mothers side. His mother was born in Longreach, Queensland, of the local Iningai tribe. A popular maker at Spirit Gallery with a wide range of styles and prices to suit everybody.